If you are considering building a new pool, do your research and follow these tips to find a great pool builder and avoid the old bait and switch. We suggest starting your search with North Georgia Pools. You’ll find that we check the boxes for all of these must-haves for a professional pool contractor. Speaking of the old bait and switch—We’ve all heard the horror stories. Someone signs a contract with a pool builder who is very responsive, friendly, and helpful, and as soon as the ink has dried, the person they struck the deal with disappears. In their place is a work crew which, if you are lucky, has a knowledgeable foreperson who is clearly in charge of the project. If you are unlucky, you might end up with a crew that lacks leadership and comes to you for answers to questions that require the expertise of a professional pool contractor, which you clearly are not. Asking who the foreperson on the job will be is the number one question to ask. Make sure you’ve met them, you know how to reach them, and that they will be your point of contact for every part of your project. There are a lot of options when deciding what type of pool to build. 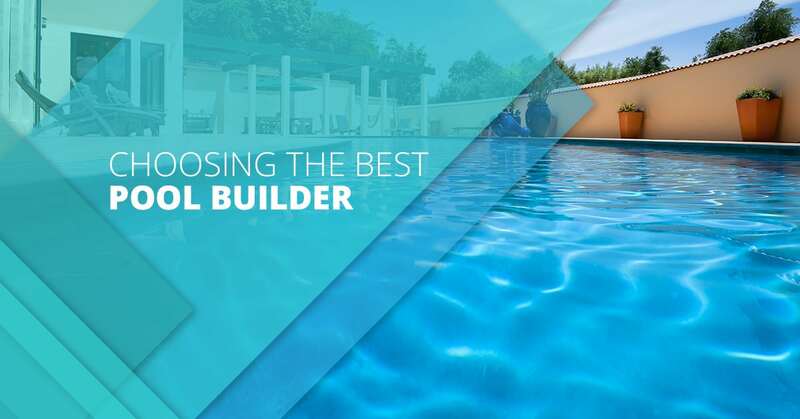 Quizzing potential pool builders on these questions will help you choose an expert in the type of pool you want to build. Ask your builder to describe the pros and cons of pool types, including inground fiberglass and vinyl pools, and above-ground pools. You may be surprised by what you learn about each option. You might even find that an option you weren’t considering is better suited for your space, your budget, and the way you intend to use your pool. Find out how many years your pool builder has been in business. Ask for references. A good rule of thumb here is to ask how many pools the company installed last year. Then ask for references from people whose pools were installed last year. If the company claims to have installed 100 pools, but can only offer you two references, that should raise a red flag. Either they didn’t really install 100 pools, or only two of those customers were happy with their pools. Raise this as a concern, and if you don’t get a satisfactory answer, keep looking. Ask for recommendations on different types of pool equipment. Get specifics about why certain filtration and water circulation systems, covers, and safety options are better than others. Then research the answers you get. If you find conflicting information, ask for clarification. Get more details. If you don’t feel like you are getting an honest, straightforward answer, continue your search for a pool builder. Some basic research can help you avoid a potentially terrible experience. Find out if your pool builder has all of the necessary licenses and insurance coverage. This information should be readily available by calling the company’s office. Ask pool builders to share a copy of their contract with you in advance so you can review it, and if necessary, have a lawyer look it over. This is actually a very good practice with any kind of builder or contractor. Always remember the warning, “buyer beware.” A good business person will never be offended by you looking out for your best interests. In fact, they’ll understand that the better informed and prepared you are, the more successful the project will be. It is very important that once your pool construction is completed, you have a clear plan of action for maintaining it in the best possible condition. Is your pool builder prepared with a plan to help you get started? Or do they not consider that a part of their job? You should consider that part of their job. Does your pool builder offer repairs? They built your pool, so they are going to be more familiar with it than any other pool repair service. We highly recommend that you hire a pool building company that also offers comprehensive repair and maintenance services. All things being equal, cost is the lowest common denominator. But it is virtually guaranteed that if you do your research and follow the recommendations we’ve made here, you’ll find that all things are not equal. You want to choose a pool builder that offers an option within your budget. But you don’t want to choose a budget pool builder. If you can’t find an option that fits your needs, it is probably best to either reset your expectations and come up with a new plan for a pool that will cost less to build, or wait until you’ve saved a bit more and can afford the pool you’ve been dreaming of. Whatever you decide, take your time and do the necessary research. It is easy to get excited about home improvements, especially something like a pool. You should be excited. Just don’t let your enthusiasm cloud your judgement. If you are running up against weather constraints or other deadlines that are pushing you toward choosing a pool builder that you aren’t really thrilled with, please slow down and take stock of what is really important. Give us a call here at North Georgia Pools. We’ll come out and do a free at-home estimate. We’ll answer all of your questions. And we’ll do a great job installing your new pool on time and on budget, without cutting corners.